Another tool that makes this possible is Looker, which was the first vendor to create a dedicated Snowflake connector. 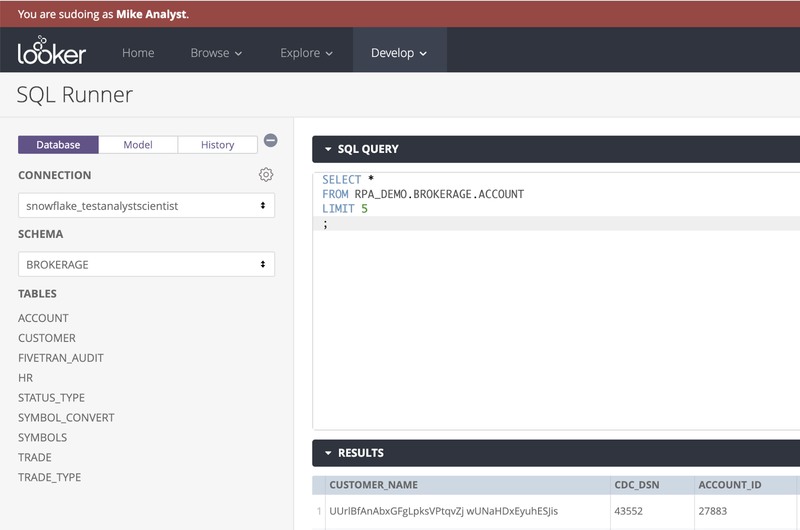 Looker is a great choice to use in conjunction with Snowflake because, among other reasons, Looker does nearly all of its processing on the database using SQL. I only say “nearly” because of things like merged results and table calculations; the heavy-lifting is certainly done on the database. 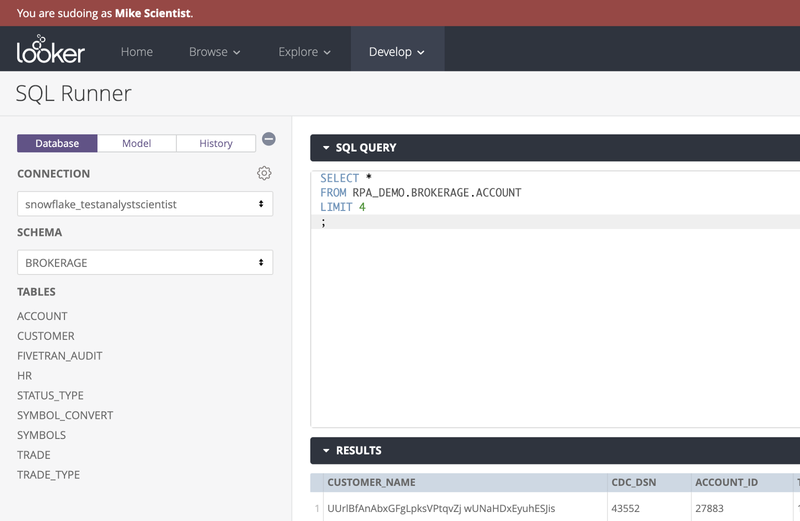 By utilizing the database for processing, Looker takes advantage of Snowflake’s on-demand, elastic compute. There are two users accessing the same Snowflake database. One user is a finance analyst interested in aggregating finance data; and the other: a data scientist performing statistical analysis. The finance analyst’s workloads are typically lighter and take a few seconds to complete. On the other hand, the data scientist is writing complex queries that use analytical functions; these queries return in minutes rather than seconds. In this scenario, I don’t want to ratchet up the compute power I’m giving to the finance analyst as there is no reason to. I do, however, want to give the data scientist some more compute resources to work with. Snowflake’s shared data, multi-cluster architecture allows me to do just that. In this case, we will use the User Attribute functionality to control a database connection. The process is fairly simple so without further ado, let’s get started. The bread and butter of the setup is configuring a new User Attribute in Looker. There are a few options to set on the Definition tab. The configurations below will create a new User Attribute named snowflake_wh that each user can see in his or her profile but cannot edit. 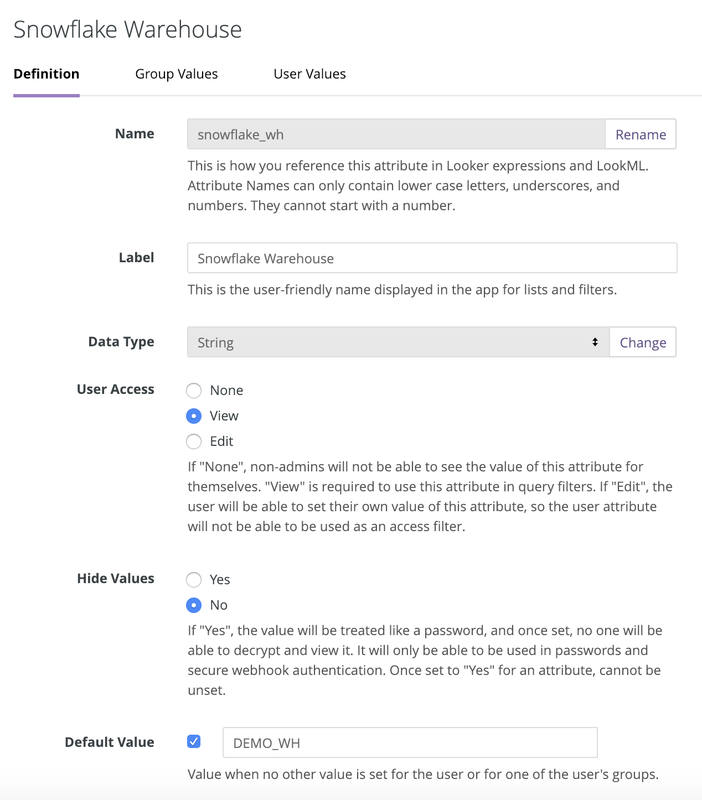 The default value is to use the DEMO_WH in Snowflake; we will set the other values in the next step. Navigating to the Group Values tab for the new user attribute and clicking “Add Group” reveals the list of groups available in our Looker instance. 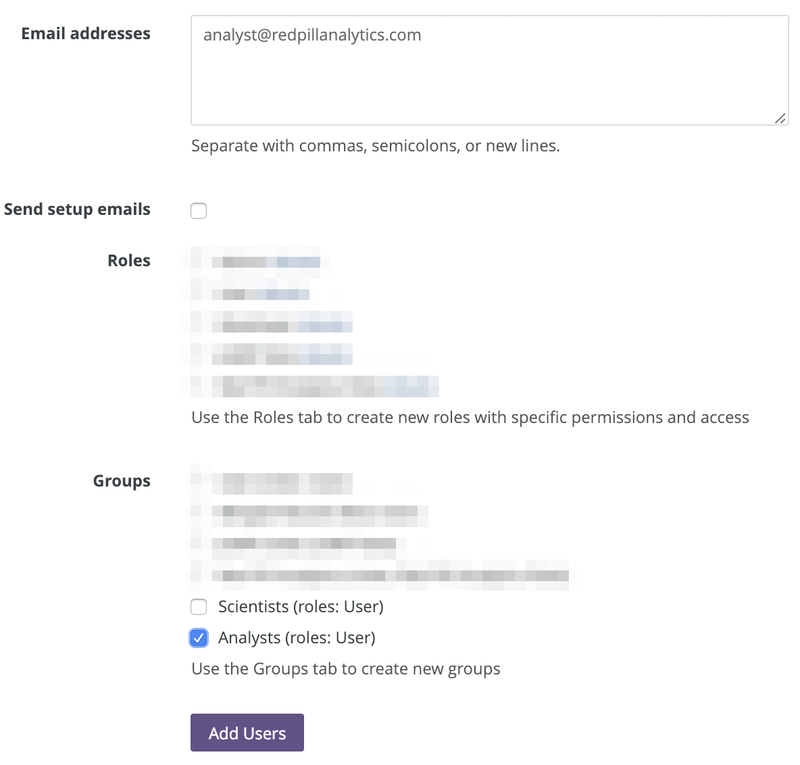 For the Analyst and Scientists groups, assign the ANALYST_WH and SCIENTIST_WH, respectively. Individual users can also be assigned a value but we will stick with groups for now. Controlling which Snowflake warehouses are used by an application allows greater flexibility and usage tracking. In some cases, organizations have a good handle on the scenarios that require more (or less) processing power, many times because users have screamed long enough about poor performance. 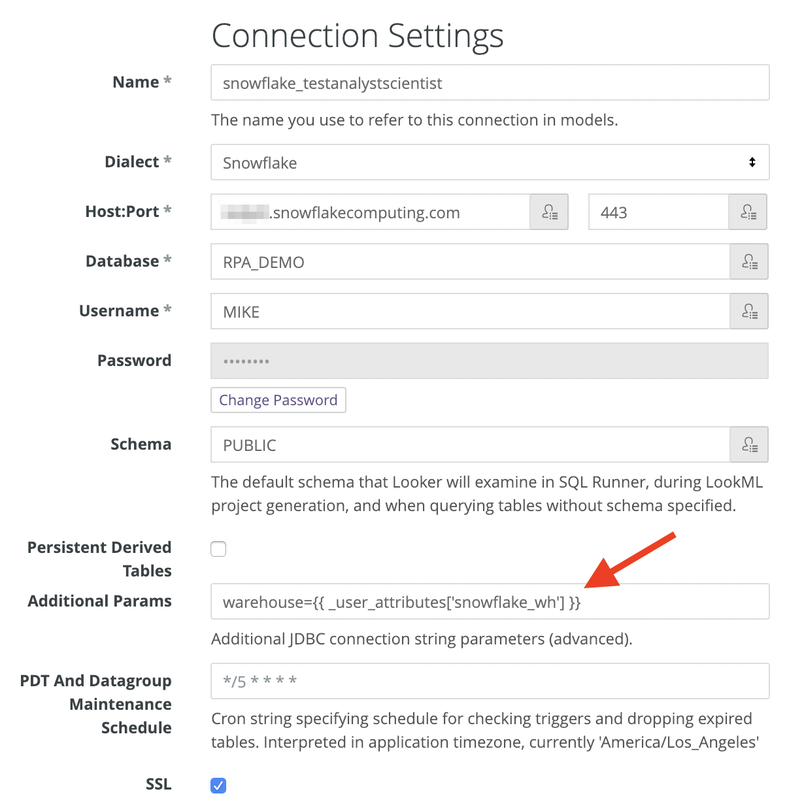 In an effort to be more proactive, I encourage taking a look at some of the usage tracking functionality that Snowflake offers in the form of system-defined table functions. Analyzing the information in these table functions will assist in making ongoing data-influenced decisions on the number, sizes, and shapes of Snowflake warehouses in your environment. Red Pill Analytics is a Snowflake Solutions Partner as well as a Looker Consulting Partner with many of our consultants certified in both Snowflake and Looker. From proof-of-concept to implementation to training your users, we can help. If you are interested in guidance while working with Snowflake, Looker, or any of your data or analytics projects, feel free to reach out to us any time on our website or find us on Twitter, Facebook, and LinkedIn.